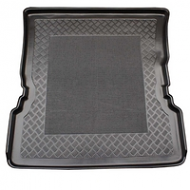 MAZDA MPV BOOT LINERS are made from a flexible hard wearing plastic, The center has a rubber anti slip mat surface and the lipped edge follows the mazda mpv boot exactly. the perfect accessory for your car. An exact fit every time.